Students often have mixed emotions when a semester ends and finals are over – anxiety, stress and relief. 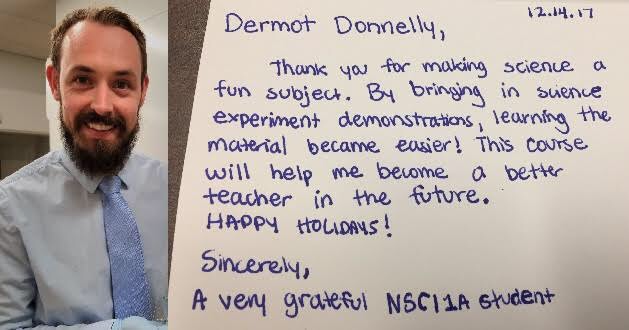 One student at Fresno State felt particularly thankful for the time spent and things learned in Fresno State associate professor Dermot Donnelly’s science course. Donnelly said he found the card stuck on a notice board by his office door. “I don’t know who left it,” he said. Donnelly told The Collegian that the course, integrated science in physics and chemistry, is for future elementary and middle school teachers. He said he strives to make it engaging with a newly-redesigned lab, made possible by funding through the National Science Foundation through the Improving Undergraduate STEM Education (IUSE) program. “I’ve spent the last two and a half years redesigning the course and introduced a new lab structure this fall that supports students to be creative and design their own experiments,” he said. It wasn’t the first time Donnelly got gratitude from his students. 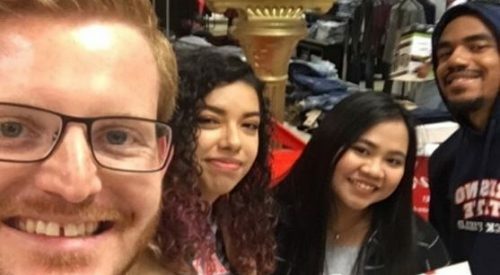 In the fall of 2015, he said students from the same course thanked him with a local tea house gift card.